Made of 100% sucrose, which provides the highest amount of energy to hummingbirds. 8 oz. Bag makes 48 oz. of hummingbird nectar. 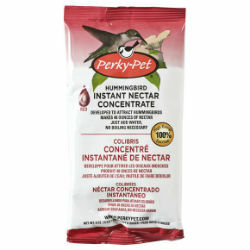 This hummingbird nectar concentrate is so easy to use! Simply stir in water and there’s no boiling required. Mix 4 Teaspoons of nectar concentrate for every 3 fl. oz. of water until you reach the desired amount of nectar solution. 4 Tbsp. + 2 tsp. 6 Tbsp. + 0.5 tsp. 9 Tbsp. + 1 tsp. 2/3 cup + 1.5 Tbsp. 1 cup + 2.5 Tbsp.